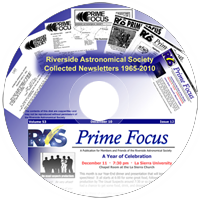 Five Decades of Prime Focus on DVD! Purchase a DVD containing the collected RAS bulletins from 1965 to 2015! The happenings of the club through the decades make for an interesting read. To get your copy of the DVD contact merchandise@rivastro.org.